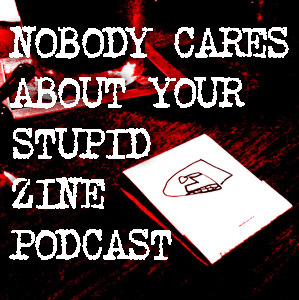 Nobody Cares About Your Stupid Zine Podcast Now Availalbe on itunes! Nobody Cares About Your Stupid Zine Podcast is now available on itunes. So, if you use itunes search for our podcast subscribe to it and listen to it all over again! This is the first Nobody Cares About You Stupid Zine Podcast with Alex Wrekk and Marc Parker. We discuss zine news and events and then interview each other about our past present and future with zines. Podcast syndication is located here. hang on for a bit. I’m getting the hang of this thing. The first episode has been recorded and needs a bit mroe editing. The theme song is recorded! and it rules! We may have the first episode up today. stay tuned for details.